Find out how the Mages Guild's excavation of Vahtacen is faring. Talk to Raminus Polus then Irlav Jarol to get your assignment. You are required to check up on the progress of research at Vahtacen, an Ayleid ruin. At Vahtacen, solve a puzzle to gain access to the inner depths of the ruin. Explore the ruin and retrieve an Ayleid artifact. Take the artifact back to Irlav Jarol then report to Raminus Polus for your promotion. After being promoted to Evoker (i.e. after completing Ulterior Motives), speak to Raminus Polus for your next task. Raminus tells you to speak with Irlav Jarol who is in charge of Vahtacen, an Ayleid ruin site that the Mages Guild is exploring to find Ayleid artifacts. Depending on the time of day, Irlav can be found upstairs in the Arch-Mage's Tower or in the lobby with Raminus. Irlav will forward you to Skaleel who is currently in charge of the research at Vahtacen. It seems she has reported that there is a blocked passage. He gives you a key to the ruins and tells you to go to Vahtacen and speak with Skaleel about solving the problem. When you reach Vahtacen (just southeast of Cheydinhal), you will find a remarkably empty cave: the first section has been cleaned out by the Mages Guild. At one end of the cave the tunnel breaks through into an underground Ayleid ruin. Here you will find Skaleel, who seems unimpressed by the fact that Irlav sent you to check on things. She tells you that they have found a pillar but have been unable to figure it out and suggests you try your luck. She warns you however to be careful and cast only basic spells. In the northwest corner of the room is a gate that opens with the key Irlav gave you. Down the passageway you'll find the pillar and Denel, another mage. It seems the pillar reacts to having magic cast on it but so far the only result has been that the caster has been zapped back. Denel also mentions tablets in the corners of the room with writing on them. He thinks these markings could be translated if he had an Ayleid reference of some sort and suggests asking Skaleel for one. As you might have guessed from the translation, you have to cast certain spells at the pillar in order to open it. These spells have to be cast at the pillar; either on target or on touch - casting spells on self will not work. The strength of the spells does not matter. Fortunately, if you don't happen to have all these spells, a chest next to Denel has scrolls that let you cast, among other effects, Flare (Fire Damage), Sever Magicka (Damage Magicka), and Elevate Magicka (Fortify Magicka). Only a scroll providing Frost Damage is missing. You can find a scroll that causes the necessary frost damage in the Bruma Mages Guild, or you can buy one from the Skingrad Mages Guild. The scrolls in Vahtacen respawn in the chest after 4 to 5 days if you used them prematurely (you will need to leave Vahtacen for four full days for this to happen). Enchanted arrows and staves with fire damage, frost damage and damage magicka can also be used. As you cast each of the four spells in sequence (Fire Damage, Frost Damage, Damage Magicka, Fortify Magicka), portions of the pillar lower to reveal a stairway. If you make a mistake, you will instead get zapped by as many of the Dark Welkynd Stones that can take aim at you. Be cautious, as one zap can kill. If you're worried about being zapped, you can stand out by Denel and take aim with your targeted spells from a safe distance. Speak to Denel or Skaleel once the pillar has opened and they will suggest that you explore the new areas of the ruins. Whether or not you chose to speak to them, proceed down the stairwell into what is a fairly standard Ayleid ruin. There are undead creatures and several traps in this area (for more information, see Vahtacen). You will eventually reach a large room with hanging cages. There is an Ayleid block switch in the southeast end of the room - go up the staircase, look to your right and you'll see it. Activating it raises stairs that lead to the center platform. Head up the platform; when you reach the top, a number of level-dependent undead will be released. There is another switch on this platform; activating it raises the cage and reveals an Ancient Elven Helm. Grab it and take it with you. Alternatively, you can climb the stairs to the first push block and then turn to the side (right or left, it doesn't matter which). Go to the side walls of the chamber. You should see a small ledge which runs all the way around the chamber. Climb onto this and walk around it. There are regular gaps which you should be able to jump fairly easily. Eventually you will come to a cage which hangs significantly lower than the others. Jump onto this. If you have high enough Acrobatics, you should be able to jump from this onto the central platform. Press the push block to raise the cage and release the undead. The advantage to this method is that the undead will be unable to reach you as you will not have raised the stairs. Show the Ancient Elven Helm to Skaleel. She will say that you may have found something very important and urges you to return to the Imperial City so the mages there can take a closer look at it. Return to the Arcane University to find Irlav Jarol and give him the Helm. Finally, report in to Raminus to advance to the rank of Conjurer and receive your leveled Robe of the Conjurer. Be sure to remember to ask Raminus for a promotion after this quest, as it is possible to move on to Necromancer's Moon without actually being promoted. While you will find scrolls with Fortify Magicka, Damage Magicka and Fire Damage effects in the chest next to Denel, you won't find a Frost Damage one. This issue has been addressed by the Unofficial Oblivion Patch; a Frost Damage spell is added to the chest. 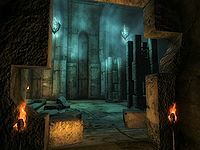 If you wish to keep Ayleid Inscriptions and Their Translations, it is possible to unlock the pillar without first surrendering the book to Denel if you know the correct sequence of spells. It is also possible to pickpocket the book from Denel after you've given it to him. An achievement will be unlocked upon being promoted to Conjurer. The pressure plates and the stair activator switch aren't reset properly when the cell resets, so if you leave and re-enter Vahtacen over 72 hours later, they may not work again to open the doors or raise the stairs and you'll be stuck with an unfinished quest. You can fix the pressure plates by opening the command console, clicking on an affected one and typing: set activated to 0. To fix the switch, put set opened to 0 in the console instead. Or for both problems simply put tcl into the console with nothing selected to either walk through closed doors or up to the otherwise inaccessible raised platform. tcl again in the console will turn normal collision back on. If you're playing on console, stepping on the pressure plate, leaving the cell though a load door and returning may resolve the problem, but otherwise you will have to reload a previous save. Standing on the pressure plate, saving and reloading may also work. If you've already pickpocketed the Ayleid Reference Text from Irlav Jarol, the quest will appear to be stalled if Skaleel gives a second copy of the book to you. However, you can still proceed by casting the appropriate spells indicated above at the pillar. You can avoid this if you have a pickpocketed copy by just not going to Skaleel and getting another one when Denel indicates to. Instead, simply pick the "Ayleid Reference" topic in conversation with him and the quest will proceed normally. You can fix Denel's missing translation by removing the second Text from your inventory by typing: player.removeitem 0003353B 1 into the console. When you go down the hall to Denel, you may be noticed by two ghosts on the other side of the wall. If Denel notices them he may try to fight them; at which point no matter what spell is cast on it, the pillar will shock you and reset. If you are detected by the ghosts after opening the pillar, the quest will continue as normal. 10 Raminus Polus has asked that I speak with Irlav Jarol about assisting with his research. 20 I need to find the Ayelid [sic] ruins of Vahtacen and speak with Skaleel. 30 A room in Vahtacen contains a pillar that reacts to magic. I need to figure out how it works, but I must be careful so that I am not harmed. It's been suggested that I should stay away from anything but simple, single-effect spells. 35 Skaleel may have some reference material for deciphering the Ayleid symbols in Vahtacen. I should ask her for it. 37 Denel has offered to find translations of the inscriptions on the walls of Vahtacen. I should read all the inscriptions, and then tell him what they say. 40 I've solved the puzzle of the pillar, opening up more of the ruins of Vahtacen. 50 I've found an object deep within Vahtacen. I should take it to Skaleel. 60 I need to deliver the Ayelid [sic] artifact to Irlav Jarol. 100 Finishes quest I have delivered the artifact to Irlav Jarol. It is possible to use the console to advance through the quest by entering setstage MG10Vahtacen stage, where stage is the number of the stage you wish to complete. It is not possible to un-complete (i.e. go back) quest stages. See SetStage for more information.